Many creatures underwater are unique, colorful, fun to photograph but also extremely small. This is where having a quality macro diopter is extremely important. Finding the lens that works best for your camera, provides the level of magnification you need for the critters you plan to shoot, and provides sharp, clear results is extremely important. 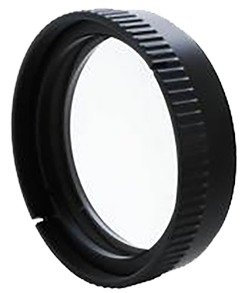 When choosing a diopter important factors will be the strength of the lens, its ability to stack for super macro (if desired), quality of the lens for producing sharp results and often price. Many lenses screw directly into your front housing port, though some work with different adapters that allow for quick removal from the port when needing to shoot a larger subject. The Bluewater +7 Macro Lens is an excellent option as it is flexible, versatile and very affordable. This lens can be used for majority of your macro shooting needs. For stronger magnification the lens can be stacked. The +7 lens is stronger than many standard macro diopters available, and provides greater working distance, making it easier to approach and shoot shy subjects. With them stacked, working distance will be significantly decreased. +7 Magnification allows for photography of subjects less than 1" on most compact cameras. The Kraken KRL-05S +13 Macro Diopter is designed for larger sensor cameras, such as mirrorless and DSLR. It provides a magnification of 2.5x actual size with a great working distance of 60-85mm (2.3-3.3") from your subject. This high powered lens is excellent for shooting super macro, and while it comes in at an affordable price point the lens provides sharp results very close to other more expensive options. 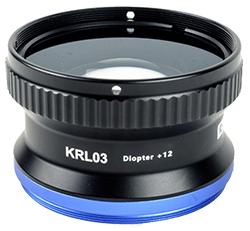 The Kraken KRL-03 +12 Macro Diopter is designed for smaller sensor compact cameras and provides excellent magnification of about 1.8x for both macro and super macro. With a wider focusing range of 10-65mm it offers more flexibility and is a little easier to use than lenses with a limited range. 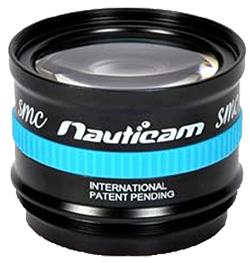 Nauticam has produced 2 versions of their super macro converters - Nauticam SMC-1 and Nauticam SMC-2. Both lenses offer very strong magnification with extremely sharp corner to corner detail, which is rare in a macro diopter. The SMC-2 offers more magnification than its predecessor, up to 4x on a full frame 100m lens, versus 2.3x with the SMC-1. Most importantly, these lenses also have an increased working distance compared to other high magnification diopters, making it easier to approach shy subjects, focus and compose your photograph. 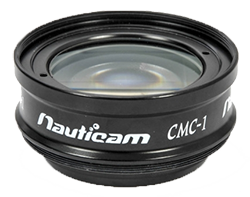 Nauticam has produced 2 iterations of their compact macro converters - Nauticam CMC-1 and Nauticam CMC-2. While many lenses are generic or designed for a larger sensor camera, the CMC line is meant specifically for compact & mirrorless cameras and are smaller and lighter than many other available diopters. More powerful than any other lens for these systems, the CMC-1 offers up to 4.5x magnification making it excellent for super macro shooting, more than a +15 rated diopter. The CMC-2 is less powerful at up to 2.8x magnification, perfect for slightly larger macro subjects. Quality and sharpness are excellent for both lenses. 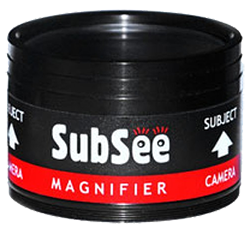 The Subsee offers 2 options of diopters; Subsee +5 and Subsee +10. 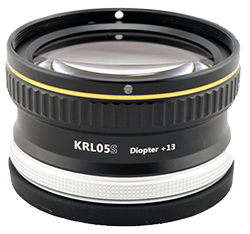 These diopters are high-quality close up lenses designed for photographers and videographers. The lenses are air sealed which means it retains their full power even underwater. Multiple elements on the lens virtually eliminates pincushion distortion and chromatic aberration. Furthermore, anti-reflective coatings on all lens surfaces increase image brightness. Subsee adapters are available for convenience.